Thanks for the picture Fred, I understand figure 5-11 from VASA I, eroded and damaged ceiling on the portside on the port side of the upper cabin, a lot better now. Is it so that the construction with the knees between the futtocks applies to all three rooms: great cabin, upper cabin and coach? VASA Plan 2 is not conclusive on this; that plan only shows the knee heads in the front part of the great cabin. The 'old' longitudinal plan from Eva-Maria Stolt shows more knee heads: in the front part of the upper cabin and in the coach. Is that plan still considered to be up to date? In general, it appears that the knees are between the frames in all of the cabins, although they vary quite a bit in dimension and not all of them are preserved. There are no hanging knees in the after gallery, abaft the bulkhead in the great cabin, which is why they are only shown in the forward part in Eva Marie's drawing. We are just starting a major project on the reconstruction of the cabin interiors this year, and so should be able to say more in a couple of years. So, no knees in the after gallery. This would mean that the beams are only lying on the deck clamps and have no connection to the side of the ship. Are the beams and deck clamps connected by dovetails to make a connection between the beams and the sides in some way? In the higher positions of the ship, the beams are placed provissionaly with their top ends against the underside of the pre-fitted waterways. In a later stage the deck clamps are placed underneath the beams to support them. Would be interesting to know if these have dovetails. There is a waterway above the gallery beams, which is bolted through the frames and to the beams, so that makes some of the connection. There is also a clamp of sorts, with dovetail notches for the beam ends, as in all of the other beams in the ship. 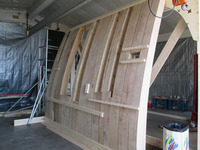 Here is a picture of the framing of the test section set up. There is a futtockmissing above the gonport, wihch cannot be set up until the upper sill in fitted. We are cutting waterway, wales and clamp today, as well as the beams, which are some monstrously large timbers. The overall size of the text section is 4 meters long and about 3.5 meters tall, with three deck beams on the inside, extending to the centerline of the ship. Thank you for the details of the fastenings of the beam construction in the after gallery. And thank you very much for the photo of the test section. Looks great. Can't wait to see the complete section assembled. Just out of curiosity: where does the oak wood for the test section come from? From Denmark, or simply from Sweden? On Bataviawerf a lot of Danish oak was used to build Batavia. I believe that at that time Denmark was the only place in Europe that had large enough oak trees. Wow, very cool! Great to see a visual of the reproduction of the hull section! We bought the oak from a sawmill in western Sweden, he buys in the logs from everywhere, mostly Denmark and Poland. I visited the 17th-century E81-wreck in Den Helder last week. I visited the wreck to have a good look into the framing of the bow. This was still a bit hazy to me. Proved to be an interesting visit: things were different than I thought. I also took a picture looking aft. In this picture some framing details can be seen so I thought it would be nice to post it here. In the foreground a section of the ship with a couple of cut floorriders on a keel section. Wow Jules, this is very interesting. Thanks for sharing! Do they know what this ship was used for? The timber around the turn of the bilge to the right lower foreground (I think it might be a first futtock) is interesting. I wonder why they would round off the end like that? Or, maybe it was because it was cut from a curved tree, and there wasnt enough diameter on that end to produce a square timber over the whole length? Yes, that is just waney surface where the dimensions of the log were insufficient to maked a squared timber. It is pretty common in Dutch-built ships to see timber like this. Vasa's frames in many cases have waney edges, some of which still have the bark on. Rnglish ships usually show more regularly squared and chamfered frames, which is prettier but wastes more timber. Thanks Fred! Now I know what "waney" means. I wonder why the English were more concerned with making squared frames and using timber more inneficiently to do so, when they just covered it with planking and cieling anyway. About the ship. It was found with some cargo onboard which suggested that the ship came from the mediterranian. They also found a swedish coin from 1654 on board. Archival work showed that the ship was probably the Samuel that sank in 1662. That ship came from Alicante and was on its way to Amsterdam. It ran ashore to the east of the island Urk. In the following years the bottom of the ship sank into the soft bottom of the Zuider-sea; the upper part rotted away. From 1937 to 1942 this part of the Zuider-sea was made into a polder and in 1948 a farmer found the wreck on his land. From 1957 to 1961 the wreck was dug up and studied. In 1969 they brought the wreck to a museum in Ketelhaven. There the wreck was kept wet for 10 years to prepare it for PEG-treatment. Since this method would take too long they decided to simply dry the wreck. This method was completed in 1983. When the museum closed in 1997, the wreck was transported to Den Helder. They placed the wreck in its own glass box in 2003, where it (after making an appointment) can be studied. I included a picture of the wreck in situ in 1961. The ship is 27 meters long and 7 meters wide. Fred, thanks for explaining the term 'waney' to me. I found a lot of parts with waney surfaces and edges in the wreck. Interested in hardrock? How about Kiss band? They are on a tour now all across USA and Canada. Click on 247reb.com/uncategorized/university-near-to-sabestian-villa-4/ to know more about KISS concert dates in 2019.